Refractory cement based adhesive mortar with quartz aggregates and special additives, created for building fire (refractory) bricks. Distinguished for its high strength and resilience at temperatures of up to 1.050°C, as well as for its adhesive strength. It is resistant to temperature variations generated within fireplaces, without cracking. The mortar develops high strengths quickly. 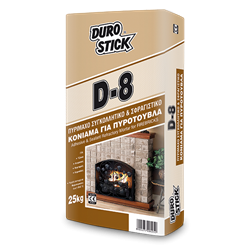 D-8 adhesive mortar is ideal for building and grouting firebricks in ovens, barbeques, fireplaces and chimneys etc. It is suitable for the repair of damaged joints, filling the openings on cracked fire bricks (common occurrence), and for reinstalling detached fire bricks. Indicatively, for fire bricks with dimensions 20x10x3cm and joint width of 1cm, approximately 5kg/m².